Box Buddy Box Handle Cutter | OhGizmo! The next time you have to move the Box-Buddy could make the process considerably less of an ordeal . It’s an easy to use tool that offers a simple way to cut ‘C’ shaped carrying handles into the sides of any corrugated cardboard box. And not only does the ‘C’ shape result in a folded handle that’s easier on the hands, particularly with a heavy box, but it also means there’s no scraps of cardboard to be disposed of. And with a price tag of just $16.98, the Box-Buddy is a no-brainer, even if it’s just a unitasker. Oh, I like this. Big boxes are always so awkward and clumsy to handle. I prefer to drop my boxes thank you. Down a flight of stairs is preferable. Exactly, bigger boxes are a pain. 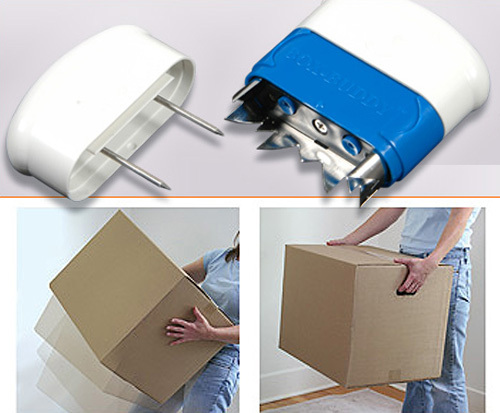 This allows you to turn any box into a carry box. The product is simple and the price isn't bad. If I moved a lot of boxes, or during my next move, I would pick one up.